It may also soon be gone. The city is moving forward with a plan to build affordable housing for senior citizens on the lot that is now home to the garden. The lot, which is city-owned and privately leased, is supposed to be cleared out by the end of autumn. 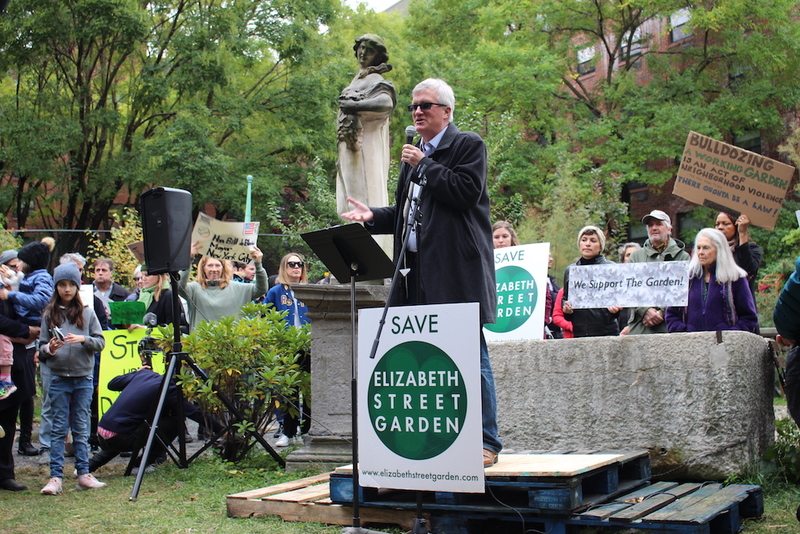 This past Sunday, Elizabeth Street Garden, Inc., a non-profit formed by advocates for the garden, held a rally to raise awareness – and funds – for their fight to save it. For just under two hours, supporters filled the garden’s lawn to listen to speakers that included artists, small business owners, and candidates for local and state offices. Each speaker had their own unique message, but one thread wove through them all: Public green space is a community necessity and it must be protected. 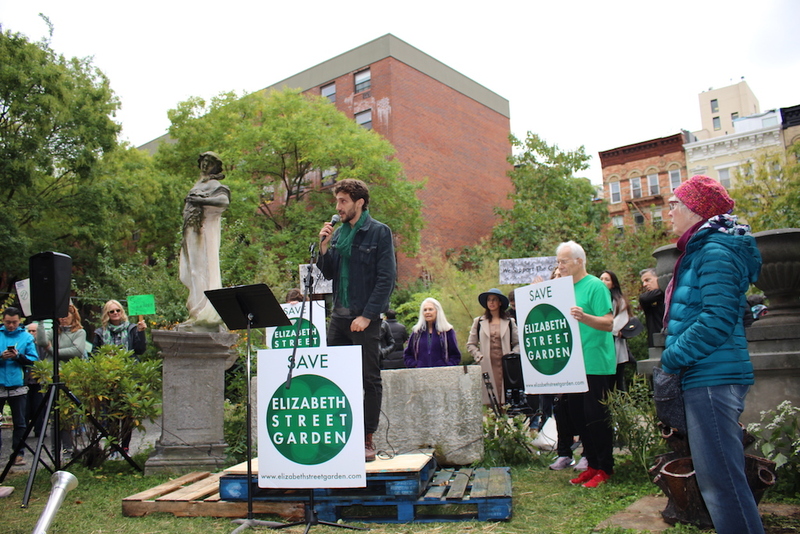 In an effort to galvanize support, Elizabeth Street Garden rolled out a new call to action during the rally. The four-point plan asks for financial donations for the coming legal battle, a show of support in the form of a petition signature, a letter writing campaign to Habitat for Humanity’s national office, and for supporters to spread the word of the fight to save the garden. Another unifying message of the rally was that the choice being presented by the city– between open space and affordable housing– was an unnecessary one. “I think we can all agree that we need affordable housing in this city, but it should not come at the expense of public community green space,” said Reiver. Reiver and Elizabeth Street Garden say they have proposed alternative sites to the city, sites they say would actually allow for more housing to be built and that wouldn’t deprive the community of what is already scarce open space. On their website, Elizabeth Street Garden, Inc. highlights five other locations where either affordable housing could be built, or market rate units could be made more affordable. Reiver says that, so far, the city has brushed these suggestions aside. “It’s careless and it ignores the outcries of this community,” Reiver told me. Reiver also said that, as currently proposed, there is no guarantee that these new units would be permanently affordable. The units would be required to remain as affordable housing for 60 years, but after that, they could be returned to market rate. Members of the community are also concerned about the environmental impact the construction and building will have on the neighborhood. The city is in the process of conducting an Environmental Assessment Statement (EAS), which is essentially the initial phase of identifying the potential environmental effects of the project. It is used to determine if a more in-depth assessment, called an Environmental Impact Statement (EIS), is needed. The EIS would delve deeper into specific concerns and their potential long-term implications. 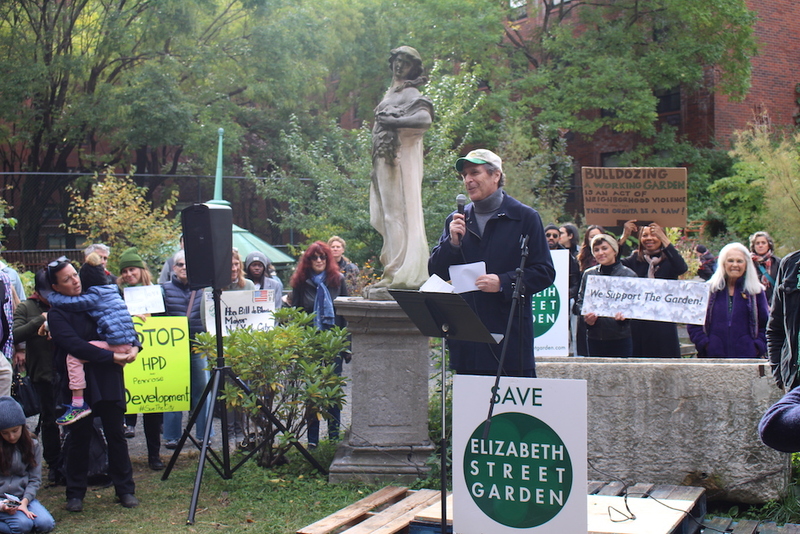 Norman Seigel, the prominent civil liberties lawyer who is representing Elizabeth Street Garden, says it’s their position that an EIS needs to be conducted. 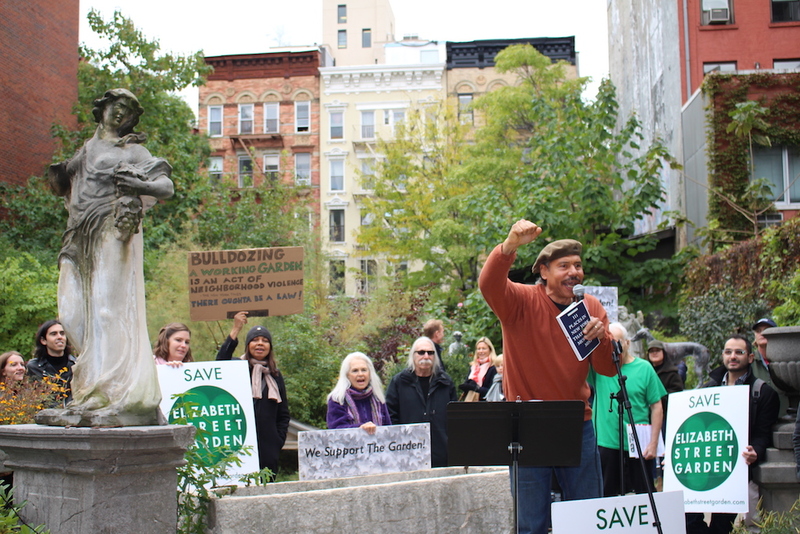 “On the EIS, the city has the burden to go through environmental factors from air quality to the character of the community to open space,” he told the crowd at the rally. 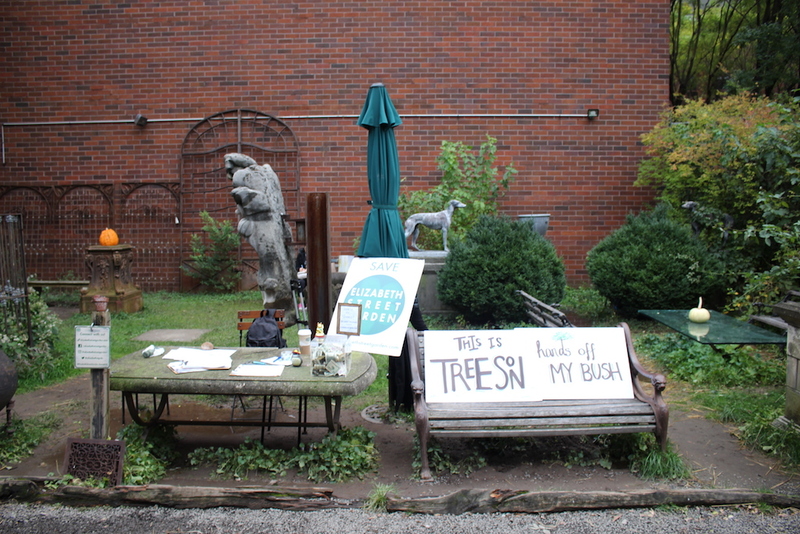 He says if the city decides to not conduct an EIS, Elizabeth Street Garden will sue. According to Seigel, because the garden falls within a historical district of the city, an EIS should be required. The fight over the 20,000 square foot Elizabeth Street lot is not new. In 2016, the city officially approved a Request for Proposal to develop the land. But tensions have escalated since December of last year when the city officially awarded the project to a developer, Pennrose Properties. Pennrose is being joined by Riseboro – a non-profit focused on affordable housing – and Habitat for Humanity, which will occupy an 11,000-square-foot office space in the new building. 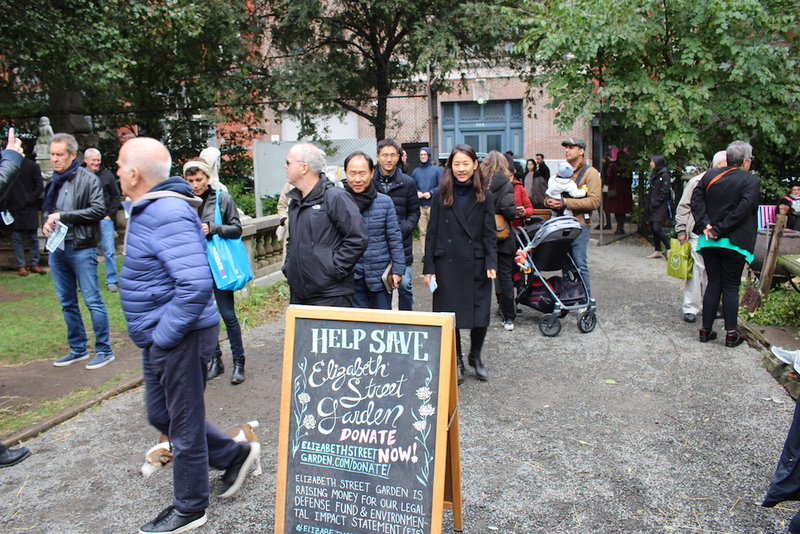 City Council member Margaret Chin, who represents District 1 where the garden is located, supports the housing project, though it was a key issue in her bid for re-election last year where she faced strong opposition due to her support. When contacted, a representative for Chin had no comment on the rally or the proposed construction project. Other supporters of the housing project, including Mayor de Blasio, say that affordable housing is one of the most pressing issues facing the city right now. After the backlash from the community, though, the developers have also offered a compromise. The proposed project now includes a new garden space that will be open to the public. Critics argue that this space will not only be much smaller than the current garden, but the surrounding building will not allow enough sunlight to the garden below. 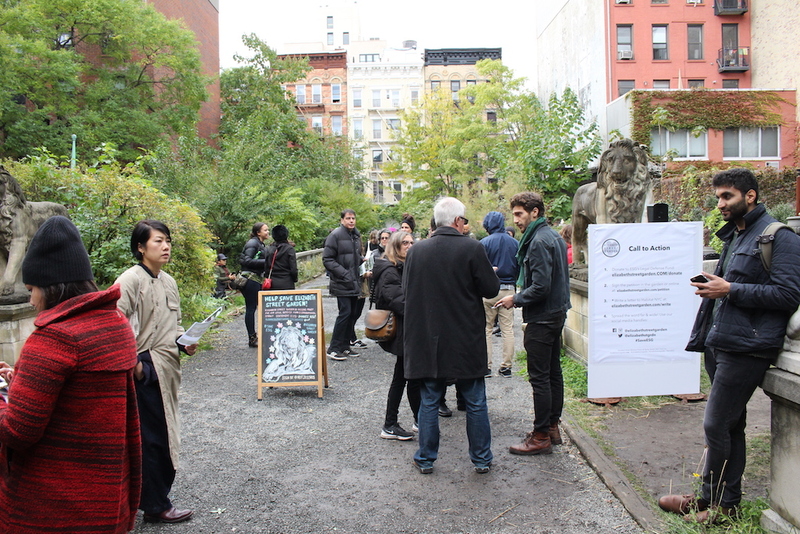 Elizabeth Street Garden has been a cornerstone of the neighborhood since the 1990s, when gallery owner Allan Reiver, Joseph’s father, leased the abandoned lot from the city to store his sculptures. Eventually, he opened the gates to the public. Today, its programming includes gardening and education, arts and cultural events, and wellness activities.